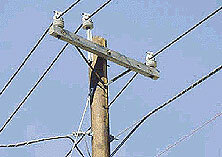 Consists Of Covered Conductors Supported On Crossarms Using Polyethylene Pin Type Insulators. Covering Thickness Dependent On System Voltage. 1350-H19 All Aluminum, 6201-T81 Alloy Or ACSR Conductors. Hendrix, 53 Old Wilton Road, Milford, NH 03055-3119. Tel: 603-249-1235 ; Fax: 603-673-1497 .